A new book about the New Orleans Baby Dolls marching groups will be featured at an upcoming launch party that will double as a fundraiser for the “One Book One New Orleans” citywide reading campaign. 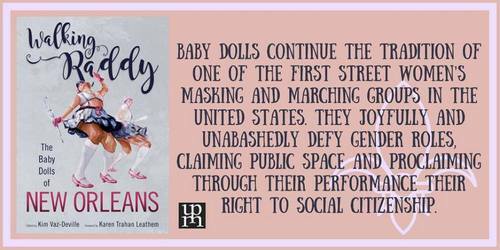 The launch party for “Walking Raddy: the Baby Dolls of New Orleans” by Dr. Kim Vaz-Deville will be held from 2 to 5 p.m. Sunday, July 22, at Xavier University, featuring scholars, artists and members of the Baby Dolls groups themselves. Vaz-Deville’s previous book, “The Baby Dolls: Breaking the Race and Gender Barriers of the New Orleans Mardi Gras Traditon,” was a featured selection for One Book One New Orleans in 2016. Admission to the event is free, with proceeds from sales benefiting OBONO. Arséne DeLay and Margie Perez will lend their musical talents to the event, Dianne Honore and the Black Storyville Baby Dolls will provide refreshments, and Baby Doll groups are offering memorabilia for raffle. In addition, visual artists who have captured the Baby Doll tradition will have work for sale. These artists include Romain Beauxis, Ann Bruce, Amy Bryan, Chilip Colwart, Kirstof Corvinus, Keith Duncan, D. Lammie Hanson, Meryt Whittle Harding, Marielle Jeanpierre, Leah Labat, Karen Labeau, Charles Lovell, Annie Odell, Nathan Scott, Gailene St. Amand, and Kim Welsh. Guests are encouraged to come in costume or festive attire to celebrate New Orleans culture and lifelong literacy! To learn more about OBONO, visit their website at onebookonenola.org. You can keep up with them on a daily basis by following their Facebook page: https://www.facebook.com/onebookoneneworleans/. To contact them directly, email onebooknola@gmail.com.